In this article, we will learn about MVC architecture, JSP, Servlet. We will learn how to get data from a JSP form to our Servlet class. Java Server Pages (JSP) is a technology to create dynamic web pages. JSP is primarily based on HTML. JSP can also be defined as Java Codes inside HTML. JSP primarily contains tags like HTML. 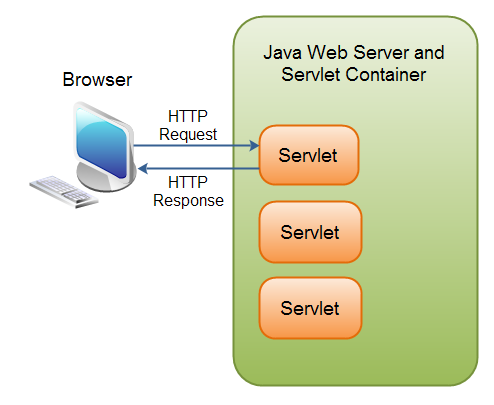 Servlets, are server side java programs. Servlets are mainly used as a controller to transfer a data from JSP form to Database. In terms of java, servlets are nothing but classes which extends HTTPServlet class (or) Generic Servlet class from javax.servlet package (or) from any other servlet api. MVC architecture, or Model View Controller architecture, is a software architecture pattern which separates the business logic and presentation logic. The entire program can be divided into layers such as presentation layer, presentation logic layer, business layer, data layer and data manipulation layer. In this tutorial JSP is used for view (or) presentation layer and Servlet is used as controller and data manipulation layer. This program is basically having two layers. The advantage is, any changes which we want to do as for the front end (or) presentation layer is concerned, it does not affect the business logic (or) in other words we are not going to touch the data manipulation layer code. MySQL is an open source relational database management system (RDBMS), which we are going to use as back end. Now we will create a simple application which will get user name and password from a JSP form and prints the values in console by means of a servlet class. Later we will see how to insert those values in database. Step 1: In this step, we will learn to create a JSP page. On looking at the above JSP page we can say it’s exactly the same as any HTML page. JSP page is dynamic and HTML page is static. In JSP we can use Java codes by means of scriplets and some other special tags. In HTML it’s not possible. JSP should be named have ‘.jsp’ as extension. So we will call the above file as registrationpage.jsp. In the above JSP page we have a form named as ‘registration’. In the form tag we have an attribute ‘action’ which tells the form where it needs to go next (or) which servlet class needs to be used for further process. The value ‘SaveUser’ for the ‘action’ attribute is nothing but the name of the servlet class which we are going to create next. This servlet class is responsible for connecting with the database and inserting the values. Step 2: In this step, we will learn to create a Servlet which get the values from JSP form. Listing 2: Shows the code to perform step 2. Step 3: In this step, we will learn how to create a database and table in MySQL. In order to execute this step you should have MySQL server installed in your machine. You can also download MySQL Workbench from the above URL. MySQL workbench is a GUI using which you can manipulate your MySQL databases more efficiently and easily. While installing the MySQL server, it will prompt for username and password. Make a note of the username and password. It will be used for further process. Create a database in MySQL and name it as userdb. Create a table in the database and name it as usertable. Create three fields serial_no, user_name and password. Listing 3: Shows the code to perform step 3. Query to create a database. Create database, commands the server to create a database. userdb, is the name that is given to the database. Query to create a table with specified fields. serial_no, is the name of the field. int, is the data type meaning integer. not null, meaning the field should never be empty. In other words for each and every record it should hold a value. primary key, is the key which uniquely identifies each record of the table. Here serial_no is the primary key. auto_increment, meaning , serial_no will start with 1 and for each entry serial_no will increment by 1.
user_name, is the field in which we are going to capture the ‘user_name’ coming from JSP page. varchar, is another datatype, declared for user_name meaning user_name is going to be some textual imformation. (30),states the size of the textual imformation. The size can be changed to any other number according to our needs. pass_word, is the field in which we are going to capture the ‘pass_word ‘ coming from JSP page. varchar, is the same datatype, declared for user_name meaning ‘pass_word’ is going to be some textual imformation. (10),states the size of the password imformation. As we know size can be changed to any other number and so the password size is set to 10, since password is something which should be small and easy to remember. Step 4: In this step, we will learn how to populate the user_name and pass_word fields in the table we have created, from our JSP form. Listing 4: Shows the code to perform step 4. In this article, we have learnt about MVC pattern, JSP, Servlet. We learnt how to get data from a JSP form to our Servlet class, we learnt how to create database and tables in Mysql and we learnt how to insert the values to the MySQL database from JSP form. In your STEP 1, I mean the JSP Form, you specified SaveUser as the action. But you created NewServlet in your Step 2. So I really cant grab the logic behind displaying the datas from the JSP Form through the NewServlet in a console. Please explain further. What is linking the JSP Form to the Servlet in step2 so as to display the datas from the JSP Form? Thanks for your comment, we will contact the author to reply your comment. Can you please give same example for getting data form database on a jsp page in form of a table. Hi Manish, I guess your question wasn't too clear. Do you want to get info from the database table and put it in a JSP? Is that?